Prosecutors want to block David and Louise Turpin from contacting the 13 kids they allegedly starved and shackled inside their California home. Riverside County prosecutors are due in court Wednesday afternoon to ask for protective orders in the stunning case that has captivated the country. 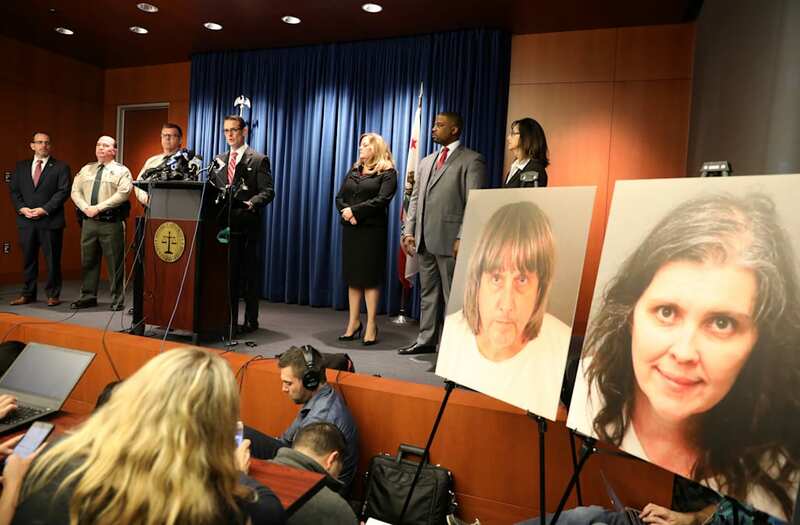 David Turpin, 57, and Louise Turpin, 49, were arrested last week and charged with cruelly abusing their 13 kids for years inside their tract home in Perris, Calif., about 60 miles southeast of Los Angeles. Their kids were rushed to local hospitals for immediate treatment of severe malnourishment and are expected to be released this week. It's possible one or more might try to reach out to the parents in jail. A source told CBS News that Riverside County already won conservatorship over the seven adult children — ages 18 to 29 — and that the six minor children will be split up to live in two foster homes. Authorities say the Turpins "frequently" tortured the eldest 12 kids for minor infractions, often restraining them with chains and padlocks. The kids were allowed only one shower a year and if they were later found to have washed their hands above the wrist area, they were accused of "playing in the water" and punished, District Attorney Mike Hestrin said last week. Hestrin said evidence in the house showed the parents did not release the "supposedly home-schooled" kids from their chains to use the bathroom. "They would buy food including pies — apples pies, pumpkin pies — leave it on the counter, let the children look at it but not eat it," he said of the parents. Their house of horrors was revealed when their 17-year-old daughter jumped out a window on Jan. 14 and used a deactivated cell phone to call the only number it could — 911. When investigators first confronted the Turpins at their residence, they rushed to unshackle two of their kids before allowing entry, according to authorities. A third sibling was found chained to a bed in the foul-smelling family home, Hestrin said. Cops said the 13 siblings all appeared to be minors at first. Years of malnourishment and abuse had stunted the kids' growth and even caused cognitive impairment and nerve damage, Hestrin said. The 29-year-old daughter weighed just 82 pounds when she was rescued, he said. The couple has pleaded not guilty and is being held on $12 million bail each. "We are alleging David Turpin touched one of the victims in a lewd way by using force or fear," Hestrin said. Bizarre video of the couple renewing their wedding vows at an Elvis-themed chapel in Las Vegas garnered new attention this week when Louise's brother Billy Lambert told "Inside Edition" his sister dreamed of becoming a reality TV star. The video shows the couple's 10 daughters all wearing matching pink plaid dresses. Lambert claimed the cookie-cutter costumes were part of her plan. "I believe that my sister wanted a reality show because, you know, the very last conversation I had with her, before all this happened, she did actually say that she feels that they would be perfect for TV," Lambert said. The brother said Louise even bragged about having more kids than the family on "Kate Plus 8," which featured Kate Gosselin raising her eight kids. "Kate Plus 8" videos were among the hundreds of DVDs found in the Turpin family garage, CBS reported.